So, it turns out I was playing unwitting host to some pretty crappy biases, and my recent reading has exposed some of them. Earlier this week I wrote about my unconscious bias against fat people, which I reckoned with when I read Shrill by Lindy West. Today, I'm discussing another audio book I listened to recently, which revealed another bias lurking under the surface of my consciousness. Nicole Mason grew up all over southern California, the daughter of a teenage single mother. Her childhood was fraught with challenges, but she managed to get out of her rough neighborhood, was accepted into college with a full merit scholarship, and wrote her memoir as a PhD holder and scholar. 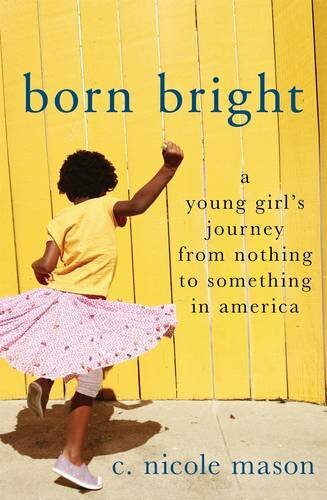 One of the reasons she wrote Born Bright was to challenge commonly held beliefs about low-income individuals. We’re told the American dream means that anyone can be anything, but the path to success is not the same for everyone despite those sunny proclamations. At the end of the book, as Mason discussed the need for better social programs and a stronger safety net to keep people from falling into poverty in the first place, I realized I have long bought into the “bootstrap” mentality that so many Americans espouse. The idea that if you work hard, you can make a comfortable living and support a family. The problem with that view, which Mason helped me to see, is that for low-income people there are barriers that middle- and upper-class individuals don't have to concern themselves with. Paying for college, for example, looks a whole lot different if you've been raised in a minimum wage, paycheck-to-paycheck household. Someone like me, with a college fund provided by parents, has a much easier time focusing on grades than someone like Mason, whose mother was on public assistance and had no savings to help her daughter pay for school. The privileges of my upper-middle-class childhood seem obvious to me now, but it's easy to have blind spots when it comes to our own experiences. Mason's book would be a great one to read if you, like me, have struggled to empathize with or understand the lives of low-income people. It's been an uncomfortable few weeks of reading for me, but I'm glad I've had a chance to own up to and wrestle with my feelings on these issues. I love reading to escape, but I also love reading to challenge myself and become a better person. Basically, books like these are helping me to not be such a douchecanoe.